Bed and Breakfasts near Jet Ski Southwest in Shepton Mallet for 1 night from Sat Apr 20, 2019 to Sun Apr 21, 2019 within 25 miles, in an Average Nightly price range of £1 to £200. Kate and Geoff welcome you to The Barn, nestled in the infectiously sleepy Somerset village of Ditcheat. The Barn oozes character and comfort with its suite of rooms, scrumptious food straight from the Aga, and the inimitable warmth of a Somerset welcome. Overlooking a pretty courtyard, offering spacious accommodation and breakfast brought to your door! Luxuriously renovated and furnished, with oak floors and exposed beams. One double/twin bedroom, dressing room, lounge/diner, kitchenette, hall, wi-fi. This unique 15th-century inn is less than a mile from the centre of Shepton Mallet. It offers an extensive menu and cosy log fires just 15 minutes' drive from Glastonbury. All of the relaxing, warmly furnished rooms at The Dusthole are spacious and airy, and some of the bathrooms have 400-year-old stone floors. All bedrooms feature TVs and DVD players. The restaurant at The Dusthole features an wide-ranging menu from traditional English dishes to far Eastern specialities. Guests can also enjoy the traditional Sunday carvery. Guests can relax in the garden and patio area, and there is a traditional log fire inside the building. Free Wi-Fi is available in public areas, and free private parking is possible on site. Located just off the A37, the inn is 15 miles from Cheddar Gorge. Longleat Safari Park is a 25-minute drive away. Formerly known as the Kings Arms The Dusthole was originally built as the provision house for Shepton Mallet prison which until its closure in 2013 was the oldest working prison in the UK. In the early days inmates had to buy their own food and drink so an enterprising governor built the provision house in order to make money out of them! br / br / br / br / In later years the provision house became a hostelry and its name changed to the Kings Arms. It is well documented that the Duke of Monmouth and his men recruited 12 Sheptonians as they passed through the town on their way to overthrow King James II in 1685 staying nearby in Longbridge. Reputedly after a heavy day s march they visited the Kings Arms (no doubt taking perverse pleasure in drinking at a hostelry of that name!) to enlist new members to their cause. br / br / br / br / You may be wondering why the Kings Arms became known as The Dusthole. In the 1900s the main industries in the town were based around the local stone quarries. Workers would often call in for a drink or two on their way home dusty from the stone they d been working with all day and leaving evidence of their visit as they brushed themselves off while chatting and enjoying their pint. Hence the Kings Arms became known locally as The Dusthole. br / br / br / br / We re lucky enough to have been visited by many celebrity guests over the years. Marco Pierre White (Chef Hell s Kitchen) enjoyed a cuppa Sunday roast and a good old chat with Tony! br / br / Julian Fellowes (actor and writer) left his mark on one of our ceilings! Chris Kelly (BBC Food & Drink) is a local resident likes to pop in for a pint. Hugh Fearnley-Whittingstall (River Cottage) has been known to enjoy a sandwich or two. Adam Henson (Countryfile presenter) took a liking to our ales. Even King George V is reputed to have stayed here! br / br / br / br / Come and chat with Tony in the bar one evening and see what stories he has to tell. He s very fond of the old place and knows all its secrets! 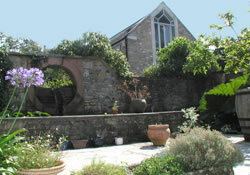 Mulberry House Bed and Breakfast is part of a four storey house in a conservation area. We provide relaxed, comfortable accommodation within walking distance of Shepton Mallet and close proximity to Bath & West Showground, Glastonbury and Wells. Built in 1790 as a coaching inn, the Travellers Rest is a traditional country pub with a friendly atmosphere. Our twin bed rooms with en-suite facilities offer colour TV, tea/coffee making faciliies and hairdryer. Relaxing Bed and Breakfast in historic town of Bruton, overlooking the Twin Towered Church and The Abbeyfield. Ideal for walkers, cyclists and those visting the area as tourists, on business or going racing at Wincanton or to The Bath and West Showground. A lovely Grade II Listed house in a friendly Somerset village, 3 miles from the Cathedral City of Wells. Relaxing, welcoming, with very comfortably appointed rooms. Free Wifi, offstreet parking, delicious choice of breakfasts. Good food pub 2 mins. Luxurious boutique self contained bed and breakfast cottage in pretty village of Dulcote within walking distance of Wells, Somerset. Only booked to one party. Short breaks in your own home from home. Beltane is a family home in Dulcote, just outside the City of Wells, yet within walking distance, our guest accommodation provides comfortable, luxury accommodation, perfect for a relaxing break of for a base from where you can explore Somerset. Featuring a garden and free WiFi, The Stag's Head Inn is located in Wincanton. Among the various facilities of this property are a terrace and a bar. The inn offers a British restaurant. All rooms in the inn are equipped with a flat-screen TV. Wells is 27 km from The Stag's Head Inn, while Dorchester is 50 km away. The nearest airport is Bristol Airport, 52 km from the property. A small Victorian Gothic mansion in a beautiful part of Somerset, Beryl is just 1-mile from Wells Cathedral. A warm and friendly welcome awaits every guest in this family-run home. Experience a stay for luxury bed and breakfast at 'Beryl' with Holly Nowell and her daughter Mary-Ellen in their unique, treasured, small Victorian Gothic mansion, built circa 1838, in its original parkland of 13 acres overlooking Wells Cathedral and countryside but only one mile from the City Centre. Chair lift to the first floor. The building of the house was started in 1838 and completed in 1842 built for a local lawyer Edmund Davis. Earl Mount Cashell subsequently used it as a Hunting Lodge. In 1916 the Jenkins made Beryl their family home until we were so fortunate to purchase it in 1979. Since then we have lovingly restored the house and gardens and are delighted to be able to share it. br / br / br / br / Nestling in the Mendip hills one mile from the centre of the cathedral city of Wells Beryl is set in 13 acres of parkland. Within the grounds are finely manicured lawns carefully tended borders and a restored Victorian walled garden. Your arrival will be greeted with warmth and courtesy the epitome of country house hospitality and a welcomed afternoon tea/coffee and cake awaits you. br / br / br / br / Elegant reception rooms are comfortably furnished with antiques offering you the chance to relax by warm fires on a cold day play board games or watch television - find a quiet corner to sit and read a favourite book and maybe take a drink from the honesty bar. br / br / br / br / The garden is an interesting walk it contains a Victorian walled garden. A gully with an old stone bridge and the most beautiful English Bluebells (when in season) an ornamental pond and various avenues of maturing trees on the lower lawns. A children s play area can be found on the main lawn and our outdoor pool is open May to September (weather permitting). br / br / br / br / Each of the uniquely decorated bedrooms come equipped with everything a guest needs to enjoy their stay. The beds are all extremely comfy and some rooms boast impressive four-poster beds. Most rooms on the first floor have a bath and shower facilities whereas rooms on the second floor all have a shower. br / br / br / br / After a good night s sleep breakfast is served in the traditional dining room overlooking the main lawn. An impressive continental buffet and a freshly cooked breakfast straight off the aga await guests every morning. The Holcombe Inn near Bath is a 17th Century grade II listed building taking its name from the village in which it is situated. Holcombe is an old village which even has a mention in the Domesday Book. The building is packed with original features and interesting nooks and crannies. Recently extensively refurbished we are sure that you will find this a delightful place to enjoy a drink and a superb meal or perhaps come and stay for a few days. br / br / br / br / Just 30 minutes away from The Holcombe Inn you will find the city of Bath a UNESCO World Heritage Site in its own right filled with architectural gems including The Royal Crescent The Circus and Pulteney Bridge - delightful waterways gardens and parklands natural thermal spas and of course a multitude of specialist shops cafes and bars. br / br / br / br / Bath has a full calendar of events each year the climax being the annual Christmas market in the city centre. br / br / br / br / Traditional dishes with a modern twist we create the freshest finest most wholesome food with ingredients sourced from local suppliers. We make real chips! With a choice of guest ales keg beers spirits liqueurs & alcohol free drinks and 20 quality wines served by the glass as well as by the bottle prepare to be spoilt for choice! This 17th century Grade II listed building, takes its name from the village in which it is situated, and is packed with original features and interesting nooks and crannies. The Holcombe Inn offers quality accommodation and excellent food in a restful country-inn environment. Visit the local area including Bath, Bristol and Wells, and return for an evening meal in the award-winning restaurant. Staff at the recently and extensively refurbished inn are sure that you will find it a delightful place to stay. Charming 17th Century family home on the ancient Roman road, lying in shadow of Downside Abbey on the Mendip Hills. An ideal central base for Bath, Wells, Bristol, Glastonbury, Cheddar, Stourhead, Longleat, Stonehenge etc. This 17th-century coaching inn is situated in the peaceful village of Nunney, in Somerset. It boasts a large open fireplace and old exposed beams, and has a walled garden that is lit at night for al fresco dining. With free Wi-Fi and free parking on site, The George at Nunney faces the moated castle that dates back to the 14th century. The charming town of Frome is just 10 minutes' drive from the building. Traditionally furnished and elegant in style, many of the rooms at The George still retain original features. Each benefits from a flat-screen TV, DVD player, and an en suite bathroom with free toiletries. Guests can enjoy modern British cuisine with Mediterranean and Asian influences. There is a light lunch menu, an Ã la carte menu, and a fixed-price menu for you to try. Options include homemade pizza, fish and chips, barbary duck, and delicious burgers. Located in the heart of the Somerset country side yet within easy reach of so much of what the South west has to offer.The Catash Inn at North Cadbury is the centre of this small friendly community.A well stocked bar varied menu featuring home cooked food comfortable accommodation large beer garden and private car park make it the ideal destination for business or pleasure.Just a mile from the main road and with easy access to the motorway makes the Catash an ideal destination. The Redan Inn is a newly refurbished public house with seven boutique rooms. Situated in the small village of Chilcompton we are ideally located a short drive from the cities Bath Wells and Frome. The Redan itself however is nestled away in the picturesque countryside of the Mendip Hills Somerset. We are set in the scenic Mendip countryside but only a short drive from the local cities Bath Wells and Frome making us ideally placed for exploring the South West cities or country combining a relaxing rural retreat or a short city break. br / br / br / br / The seven rooms all have wonderful individual period features and are decorated with vintage and antique furniture and artwork. Every room has an ensuite fitted with brand new Victorian bathroom furniture with powerful rain showers. The luxurious suites also have freestanding roll top baths. br / br / br / br / We are proud to boast a pub and dining room serving modern British food made from locally sourced produce so our guests are able to enjoy food and drink with us too. br / br / br / br / All rooms are equipped with the following: br / br / Cosy feather and goose down pillows and duvets from Loaf br / br / Matresses and bedframes also from Loaf br / br / Bramley bath products - handmade in the South West of England using only natural ingredients br / br / Complimentary Wireless access br / br / Samsung televisions br / br / Tea and coffee from local roastery Brian Wogan br / br / Your booking includes complimentary continental breakfast br / br / br / br / Our aim is to provide bed and breakfast in cosy comfortable rooms which will ensure a great night s sleep. We think it is important for our guests to have a guaranteed touch of luxury during a stay with us - we have high quality beds duck and goose down duvets and pillows and spacious bathrooms filled with natural bath products from Bramley and 100% cotton towels. We know that these things come together to ensure a refreshing luxurious and comfortable stay. Camelot is a magical mystical space set in a tranquil location with stunning views of the tor & meadows. Camelot is within walking distance of all main attractions: Chalice Well Glastonbury Tor The Abbey High Street plus all other places of interest. Welcome to Chindit House - Luxury 4 Star Bed and Breakfast Chindit House is a beautiful stone mansion set in an acre of secluded grounds in the historic centre of Glastonbury. For those who seek spacious guest house accommodation with style and tranquility. The rooms are large and elegantly furnished each with new luxury beds and its own modern ensuite. Peter and Felicity look forward to welcoming you. 8 Owls is located on the High Street in Glastonbury.It has the true flavor of an old inn, but with all the amenities of a modern boutique hotel. Main House has 4 ensuite bedrooms and the cottage is one bedroom with also day bed in living room and kitchen. A charming home dating from the 17th Century, located in a lovely walled garden, offers comfortable and characterful accommodation. Most rooms have exposed beams and window seats. Accomm - One double room with private bath/shower and one single/twin room. Healing, spiritually recharging home from home. Have the space you desire, and needs attended to! Has all the amenities one could wish for. Ideally located in town centre, but off the main road. Therapies available. A warm welcome awaits in Avalon! Stay in your own luxury en suite apartment in a wonderful Grade II listed Vicarage. The Old Vicarage is in Kilmersdon - home of the Jack and Jill nursery rhyme.<br> 11 miles from Bath and Wells, 7 miles from Frome and near to many National Trust properties. Situated just 20 minutes from Bath Wells and Glastonbury in the market town of Midsomer Norton The Old Priory is reputed to be one of the oldest houses in Somerset with records showing that it was established in 1170. This historically significant building was an Augustinian Priory in early medieval times later being seized by Henry VIII and gifted to Christchurch College Oxford. Today the ancient honeyed stonework and a beautiful walled garden greet you upon entering the gravelled driveway. Within this Grade II building many original architectural features are retained including large inglenook fireplaces flagstone floors and original oak beamed ceilings. A curvy flight of stairs within a Somerset staircase turret lead to the upper floors and heavy iron studded doors open to beautiful rooms which were refurbished in 2014/2015. The six individual bedrooms share a style which reflects the charm and atmosphere of the old combined with the comfort and convenience of modern day living. Traditional coaching Inn situated just 2 minutes walk from the town centre, in the heart of 'old' Frome. The en-suite rooms are well appointed and spacious with a full English breakfast being served in the breakfast room each morning. The Cornerhouse Pub Hotel & Restaurant.